Just for the record, JAIF’s daily plant status posting shows that, as of August 23, over 56,000 tons of waste waters have been decontaminated by the two clean-up systems now in full, continuous operation at Fukushima Daiichi. The volume of waters that remained to be processed was around 96,000 tons. Currently, 20,000 tons of decontaminated water is being stored for injections into RPVs 1, 2 & 3. More good news the news media, including Japan’s, fails to report on. Many of the Japanese news media outlets are reporting on the recent death of a worker employed by a subcontractor at Fukushima. He died of leukemia, a form of cancer linked to massive fallout and bomb blast exposures at Hiroshima in 1945. The worker’s total exposure while at Fukushima was ~0.5 msv, which is more than 200 times less than the lowest level theorized to cause biological harm. So, why is this worthy of news coverage? Because it appeals to the Japanese public’s widespread radiation phobia! As the Worldbytes documentary “After Fukushima : The Fear Factor” (Aug. 27 update) points out, the news media believes that the word “radiation” terrifies most people and attracts them to news reports. Keeping the public terrified seems to be an on-going media ploy, even in Japan. Telling it like is isn’t, Mainichi Shimbun reports on two workers who recently ignored their dosimetry alarms while working on one of the waste water decontamination systems. The dosimeter’s alarm set-point for exposure on the specific job was 15 msv. The two workers were nearing the end of their work, so when their dosimeters alarmed at 15 msv they continued working to completion. As it turns out, the exposure was almost entirely Beta radiation. Now, here’s where The Mainichi report gets absurd…”Beta rays are a type of radiation that can penetrate the skin and enter the body.” To the contrary, Beta particles are a type of radiation that cannot penetrate the skin and enter the body. This is yet another example of the Japanese news media needing an education on the realities of radiation. Here’s what’s troubling…the map follows almost exactly what the SPEEDI airborne contamination forecast predicted during the week-long period of copious releases beginning with the unit #1 hydrogen explosion of March 12. The very same SPEEDI data Kan and his government emergency response team refused to use when making evacuation decisions… because they didn’t understand it! This was clearly a violation of Japanese law. Basic Plan for Emergency Preparedness; Volume 10. 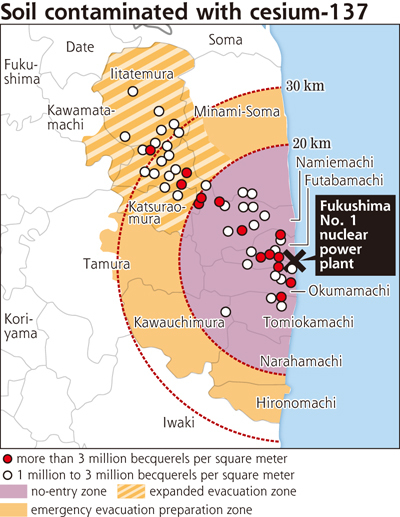 “Nuclear Emergency Response” (May 2000) states “[While] the National Government predicts the state of nuclear reactor installation, it carries out radioactivity influence prediction by SPEEDI network system, and connects information required for enforcement of emergency response to the local government.” How different would the evacuations have been if SPEEDI would have been used? Kan and his staff ought to be held legally responsible for this intentional act of negligence. The New York Times reports that April’s permanent shutdown of eight nukes in Germany has produced a power shortage. This has reopened the nuclear issue…somewhat. Not that the public wants the government to reconsider their nuclear moratorium. They don’t. However, business and industry have scrambled to try and live with a sudden loss of 12% of Germany’s electricity production. “It’s easy to say, ‘Let’s just go for renewables,’ and I’m quite sure we can someday do without nuclear, but this is too abrupt,” said Joachim Knebel, chief scientist at Germany’s Karlsruhe Institute of Technology. And, he’s not alone. Newspapers have begun reporting that after shutting down the nukes, the nation has bought power from France and the Czech Republic to avoid a shortfall. Most of the purchased power comes from nukes. German power companies have had little or no choice. While the government touts their belief in renewables, it looks more and more like they will need to build new coal or natural gas plants to meet demand, and increase greenhouse emissions. The Times asks, “If Germany, the world’s fourth-largest economy, falls back on dirty coal-burning plants or uncertain supplies of natural gas from Russia, isn’t it trading a potential risk for a real one?” Lazlo Varro of the International Energy Agency says, “The nuclear moratorium is very bad news in terms of climate policy. We are not far from losing that battle [climate policy], and losing nuclear makes that unnecessarily difficult.” But, coal and natural gas don’t have that terrifying word “radiation” attached to them. Another example of the Hiroshima Syndrome at work.